class="page-template page-template-page-sections page-template-page-sections-php page page-id-719 samba_theme wpb-js-composer js-comp-ver-4.1 vc_responsive"
Here at QCF Bournemouth, we understand that maintaining the flooring of your high-traffic areas can be demanding. There never seems to be a good time to get it done without causing disruption. Therefore it’s important that you choose a flooring partner that has experience in dealing with care homes and can be relied upon to get the job done to the very best standards, but in the least time possible. With over 40 years experience, we know a thing or two about fitting carpets and vinyl flooring, so you can be sure that your flooring will be laid to the very highest standards. 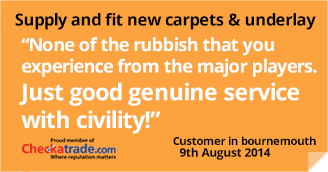 Plus with a 100% feedback score on the independent Checkatrade service, you can be sure that you’ll be looked after – every step of the way. Our team are also specialists in Wet Room flooring, making us the one-stop-shop for all of your flooring needs. So whether it is a resident’s room carpet you need, or perhaps some cap and cove vinyl fitted for a wet-room, give our experienced team a ring on 01202 430412.